Dr. Jason Winters and his staff would like to welcome and thank you for visiting the Winters Dental Office. Established in 1963, we have been providing expert dental care to the New Haven and shoreline area for more than four decades. Originally, the practice was started by Dr. Stephen Krawczyk until his retirement in 2003. 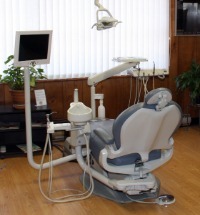 At that time, Dr. Winters took over the office and has continuously updated the facility to the highest standards by providing exceptional quality dentistry. We look forward to making all our patients feel comfortable and right at home, like being one of the family. Together with leading edge technology and our responsive, attentive dental team, you can always expect gentle and effective treatment from a whole group of caring professionals. We're accepting new patients too. You can schedule an examination appointment with our office simply by calling our main number. Please give us a call and our friendly staff will take time to answer all of your questions. We will always give you the best advice and options which suit you personally. Everyone has different needs and we want you to be happy with the results of your dental care. Your trust is important to us and we know that the true value of our service is measured by the satisfaction of our patients.